It’s a rare opportunity to travel and those who can are blessed. Anyone who travels will most likely tell you that you meet some of the greatest people on your journeys. There is truly no bond like the bond of friends who have traveled together. Last weekend I had the chance to spend a long weekend with some of those friends. I met these friends during my 17-day trip to Eastern Europe last January. We hail from very different areas around the country: two already in Los Angeles, one in San Diego, one from El Paso, one from Memphis, and finally, I hail from the great state of New Jersey. First stop upon landing? Breakfast of course! Now, I’m famous amongst my friends for being the best at finding breakfast joints. It’s a badge of honor I wear proudly. 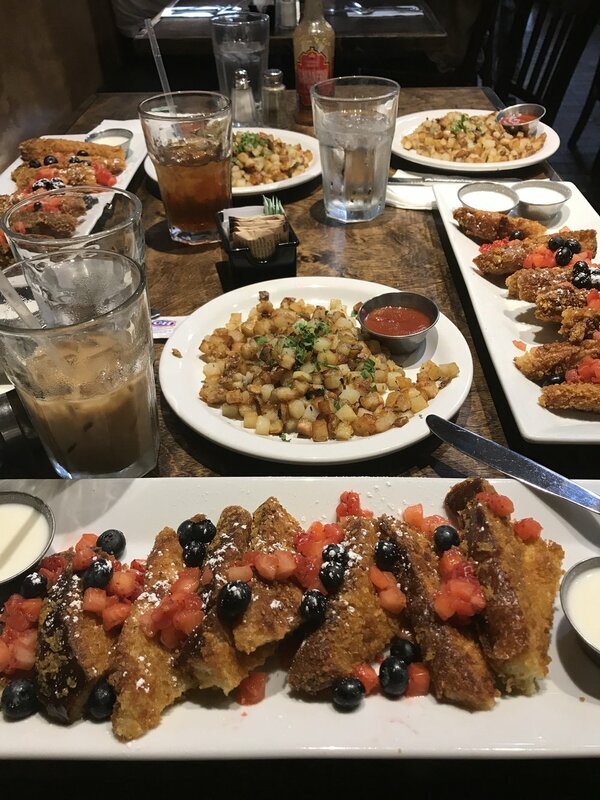 We would go on to have some pretty fantastic breakfasts over the weekend but the first was Nick’s Café. Advertised as a “downtown staple…offering a classic diner menu…” I was instantly sold. Being from New Jersey, I have a hard time saying no to a good diner. From the outside, this place doesn’t look like much. Truthfully, the inside doesn’t either. But the service was incredible, the food was wonderful (the homemade berry syrup was heavenly), and it was an all-around A+ from me! After breakfast, we headed to the Museum of Death. Not something that would normally interest me, it was a stop that was requested by my El Paso friend, Sarah. I happily obliged, since as I already mentioned, I didn’t have much left on my Los Angeles bucket list to tick off. If I could sum up this place in one word, it would have to be weird. It was not at all what I was expecting and frankly, was quite creepy. I don’t want to ruin the shock value, so I’ll leave it at that. Check it out for yourself and let me know your thoughts! Next, we headed to a LA tourist staple: the Hollywood Walk of Fame and the Chinese Theater. We stopped along the way to talk pictures of our favorite stars (Destiny’s Child & Walt Disney, of course!). As Jetlag sets in, we decide to call it an early day and head back to our Airbnb which had this adorable little outdoor area compete with a fire pit! The next morning, we started our day with an amazing breakfast from Blu Jam Café. If you’re looking for killer French toast in the Los Angeles area, this is your place. But prepared to wait, Blue Jam is popular. And it’s easy to see why. With high end coffee and tea, outstanding food, and great service, this place easily tops of the list of breakfast places I’ve been to in LA. After breakfast, we headed towards Griffith Observatory. If there’s one thing I’m a sucker for, it’s a good view and The Griffith Observatory doesn’t disappoint. 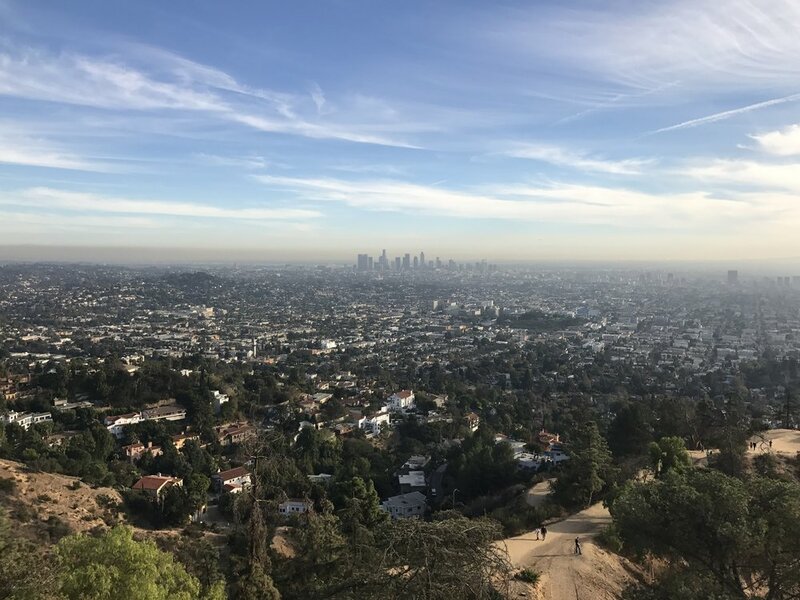 With free entry and free parking (at the bottom of the hill with the shuttle, closer parking costs $4), it’s really one of the best spots to check out in Los Angeles. We had one final stop on our second day in LA: Santa Monica. My friend from Memphis had never seen the Pacific Ocean before so it was special moment. We watched the sun set together and headed over to the pier. I must say in frank honesty: California sunsets are just okay. I’ve heard rave reviews over the years about them and I’ve truthfully never been blown away by it. If you’re looking for a show stopping sunset, I recommend a trip to Greece. Sunsets in California? Pretty standard. Finally, we met up with a friend from our European trip and had a wonderful meal catching up and laughing. Again, we called it an early night. We would need our energy for the next day. The next morning, we woke up before done for perhaps my favorite part of any California trip: Disneyland! I am planning on doing a full dive into the magic of the Disney parks (both in California and Florida) so for now, I will simply share a few pictures of the wonderful day we had. We arrived at park opening and stayed just shy of park closing. For me, there is no better day than a day spent at Disney. On our last day, we woke up and got, you guessed it, breakfast! A short drive from our Airbnb was a placing known as The Original Pantry. If there’s one thing I’ve learned about folks in Los Angeles, it’s that they take their breakfast very seriously, an attribute I respect, as I take my breakfast very seriously. The Original Pantry has been a Los Angeles staple since the 1920s and is open 24 hours. The amazing thing about this place is that much of the staff has been working in the restaurant since the 50s and 60s. Huge, fluffy pancakes top of this amazing little place. I highly recommend to all! Our last and final stop of this magical little trip was a quick drive down to San Pedro to see the Korean Friendship Bell, a gift presented to the United States to celebrate the bicentennial of the U.S. and to symbolize friendship between the two countries. This was a great symbolic way to cap off a trip visiting some great friends. We ran around the bell three times (as is Polish tradition) and headed to In-N-Out burger for one last hurrah before departing the sunny state. All in all it was a wonderful weekend getaway filled with lots of friendship and fun activities, some new and some old. Los Angeles hasn’t always been my favorite place but as I’ve learned over the years, it’s not always about where you are but who you’re with. What are your favorite spots in Los Angeles? And who do you love spending time with in your life, no matter where you are?